Avente Tile Talk: Stuck in the 60's? Not in this Bathroom! 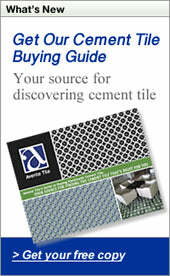 Avente Tile celebrates Bathroom Blogfest 2010 with its second post this week by Sunny McLean. Sunny contributes bi-monthly to the Avente Tile Talk Blog. She shares her knowledge and unique perspective with 30 years of experience in the tile and stone industry as well as design community. Where does almost every one of us start their day? In the bathroom, of course. In the 60's it was just a place of function but today we have a new attitude. Shouldn't the place where our day is set in motion be more than a place we're stuck with? Why not let the bathroom begin the day's events with a fresh attitude? I'm grumpy, functioning on a barely responsive level and just hoping that by some miracle each foot will find itself in front of the other as I stumble into my bathroom in the morning. I need help from my bathroom in more than the obvious ways. I need a wake-me-up-and-help-me-face-the-world kind of bathroom. I desperately need to be energized, invigorated and stimulated. I need to be delighted with colorful, reflective tiled surfaces that I am happy to see through bleary eyes. I need sculptural faucetry that is fun to look at and fun to use. I want my shower floor tile to contrast with the wall tile. As my feet steady, I relish the smooth touch of the cement floor tile. That's it: my grumpiness fades, my attitude shifts and I'm now on target to greet the new day with energy and anticipation. Hello new day, I'm ready. I love my bathroom. Walls surfaced in colorful, glossy ceramic or glass tile that is not just a "background". Floors tiled to delight my bare feet. Contrasts in color and surface texture. Great light, as much of it natural as possible. A shower system (showers invigorate) and faucet that is sculptural and fun to use. A place for my hair dryer. flowers to lift your eyes and spirits. Floors: 12" cement checkerboard tile. Handmade field tile with a layered glaze. Handpainted tropical flowers used as a border. Sunny, how lovely! That bathroom would definitely pick-me-up and energize me for the day! Love that corner cupboard and the tiles are fantastic. Thanks so much for being part of the Bathroom Blogfest festivities! I'm so glad you share my enthusiasm. I must say that I'm also enthusiastic about the opportunities that the Bathroom Blogfest present to discuss all the options available today, as compared to the 60's, for a personalized bathroom space - and at all price points. Great example of how something as simple as a bathroom can really give your day a lift! Love those floral tiles.